I’m belly up, floating in a pool, the bottom of which is festooned with smooth, white stones to read Bula Brittany and Eliza! There’s a freshly hewn and cracked coconut within arm’s reach. And I can mosey off my residence right on to the beach and the sprawling South Pacific. You see places like this from the sweeping, cinematic vantage point of a drone all over Instagram, or the pages of a glossy magazine (Men’s Journal magazine), but it makes you a little slap-happy to be in such a place yourself. I’m in Fiji on assignment with a friend from college (whose been mistaken for my wife half a dozen times; we are traveling in a storied honeymoon hot spot, after all), and it’s straight bliss. The funny thing about planning a trip to Fiji is actually the lack of planning. Call it American neuroticism, but I’ve only ever traveled with a fairly regimented schedule. So I made the long haul from New York a little apprehensive, with little in the way of an itinerary except a handful of planned activities. “You’re on Fiji time,” general managers reminded us at each resort. You can do whatever you want, and nothing you don’t. If you planned to go scuba diving, but wanna sway in a hammock palming a cocktail, go for it. The other reason for such a lax schedule? The weather dictates most excursions. Temperatures hover around 80 degrees year-round, but from November to April, tropical storms are known to roll through quite frequently. Fiji’s peak season stretches from July to September, when it’s driest (though you can also expect vacationers to flock here over the holidays). You probably know Fiji as a diver and surfer’s paradise (it consists of 332 volcanic islands, scattered closely together in the southwest Pacific Ocean), but it’s also one of the most culturally significant destinations—perfect for culinary die-hards, adventure-seekers, and anyone looking to escape reality on the other side of the world. Consider this your blueprint for exploring Fiji—we’re hitting Viti Levu, the largest of the islands, as well as Royal Davui, a private island resort in Beqa Lagoon. If you live in California, good for you: The flight from Los Angeles or San Francisco via Fiji Airways is a non-stop 11 1/2-hour flight (red-eye) into Nadi International Airport. If you’re traveling from the East Coast (or anywhere else in the U.S.), you’ll have to make your way to the West Coast first. It’s a trek, especially since you cross the International Date Line. 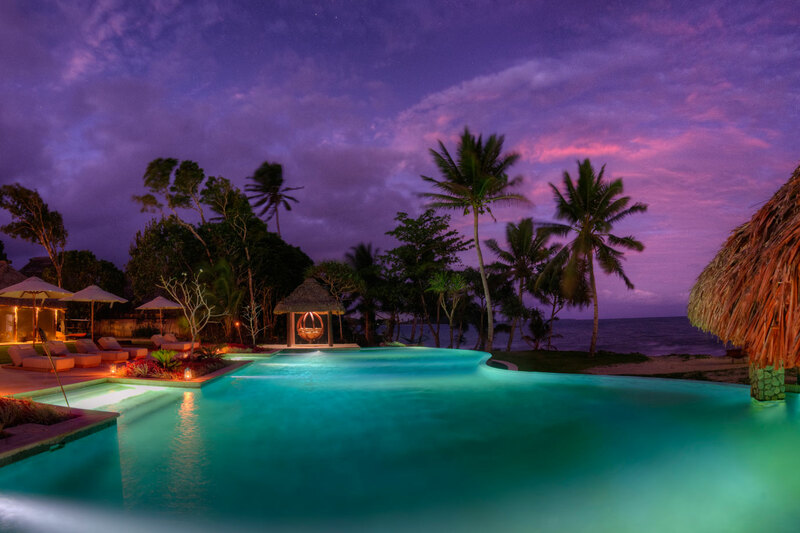 Take a road transfer from Nadi International Airport (we recommend coordinating ahead of time with Pacific Destinations) to VoliVoli Beach Resort, up on the Suncoast in the Rakiraki district of Viti Levu. As the name suggests, it’s almost eternally idyllic. We’re talking Pixar-blue skies and water. 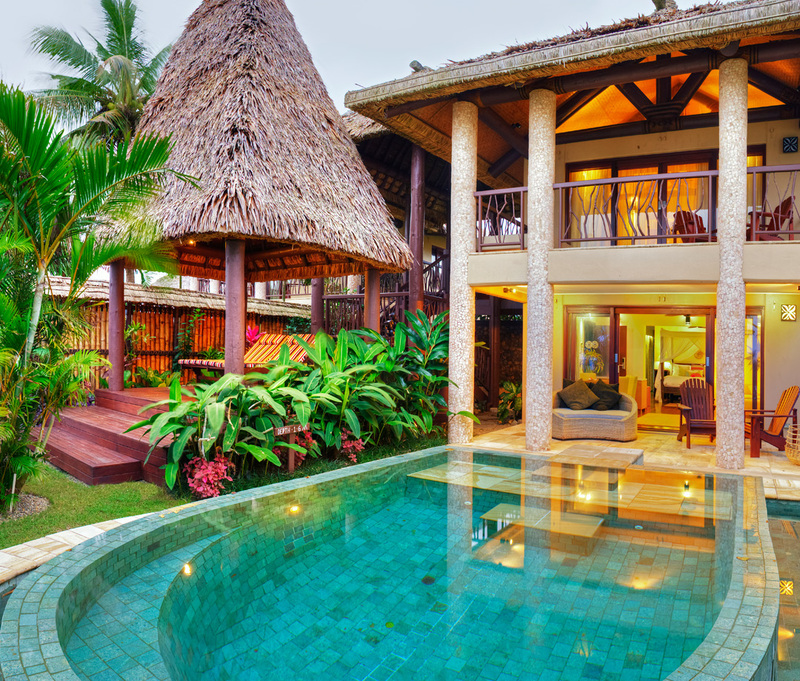 Their recently renovated Luxury Ocean Front Villas are nestled along the front edge of the resort, with capacity for four people (two bedrooms with king-size beds). Loll about in your private pool—and if you can muster the will to leave your secluded little oasis, head over to the Daulomani Spa. Indulge in a quick foot soak and rub, or stay for a coconut body buff or aromatic massage (there’s even a sunburn treatment if you’re a bit too overzealous basking in the sun); either way, you’ll hear the water lapping against the shore and have the ocean breeze wafting through. If you want to keep your first day casual, head over to Ra Bar & Restaurant, right near the resort’s dive bar. Snack on BBQ chicken and pineapple pizza or beer-battered fish and chips, and wash it down with a frosty Fiji Gold beer. 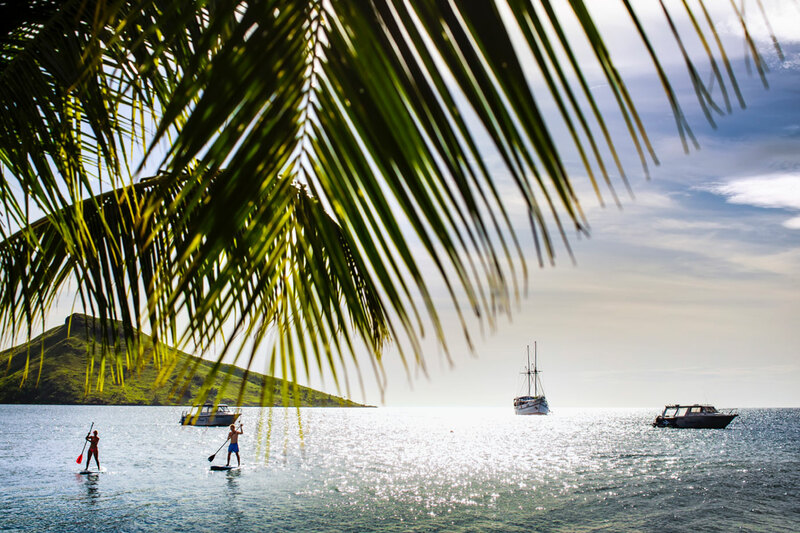 If you want more active pursuits, kayaking, stand-up paddleboarding, and snorkeling gear are available. Fiji’s the soft coral capital of the world, and the Bligh Waters just off the coast of Rakiraki are home to a menagerie of iridescent fish and rainbow coral. Naturally, the scuba diving is top-notch as well. Rinse off, then head over to the on-site Nuku Bar & Grill, an open-air restaurant overlooking the pool and horizon. 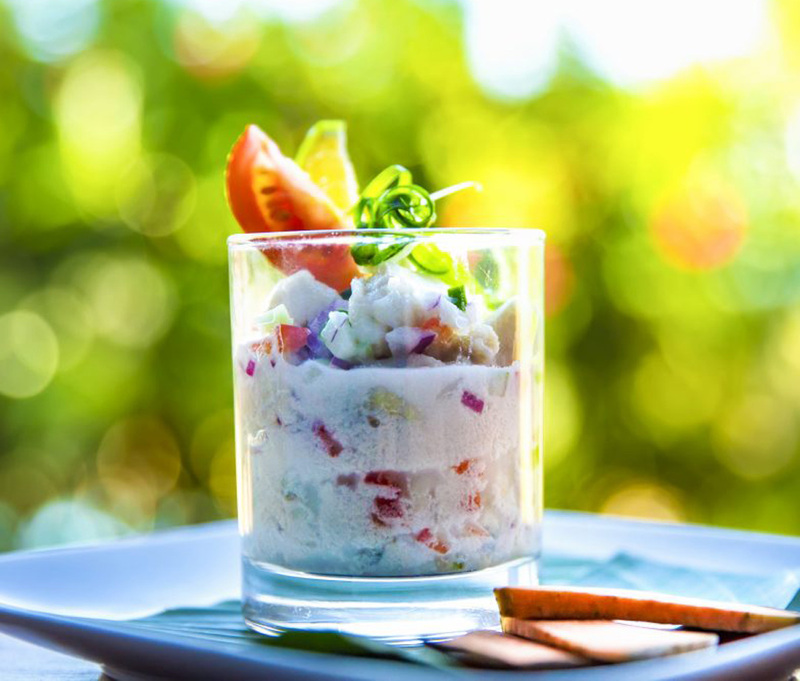 Sip on sauvignon blanc or a fresh-herb mojito as the sun sets, and be sure to order kokoda. It’s a beloved dish likened to ceviche. Raw fish (typically Spanish mackerel, or walu) is “cooked” overnight in fresh lime juice, then tossed with chilis and vegetables, and bathed in fresh coconut cream. Finish off your meal with soft shell crab or New Zealand lamb shank with whipped potatoes. Before you head in for the night, take a minute to gaze at the stars—especially if you’re a city dweller—the visibility is spectacular. In the morning, arrange for a taxi to bring you to Rakiraki Market. Peruse the vendors’ bevy of produce—including pineapple, avocado, guava, passionfruit, and exotic varieties, like soursop and tarawao. It’s a quick but lovely drive through the countryside, including cane fields, cassava patches, and rocky volcanic outcrops. Get a coconut for the ride back and sip it in one of the hammocks scattered about the property. Or, embark on the Dolphin Experience, a three-hour safari that finds you snorkeling along the soft coral reefs in Bligh Waters. Some guests have been lucky enough to see pods of up to 100 dolphins (small, swift Spinner dolphins are native to the area). Grab lunch—spicy Thai noodle salad or grilled fish tacos—and sip a cocktail by the pool, getting some down time in before another one of Volivoli’s signature tours, the Sunset Cruise. You’ll set out at 4:30 p.m. aboard a catamaran, enjoying small bites and free-flowing champagne, beer, and/or wine as golden hour sets in. You’ll loop around Malake and Nananu-i-Ra islands, making a pit stop to explore the warm waters and sand. Cap off the night with a feast: Get caramelized pork belly with apple and celery salad to start, followed by ika vakalolo, fresh fish cooked in lemon-infused coconut miti, and a cheese plate with seasonal fruit and local Rakiraki honey for dessert. Book the Nabalasere Waterfall Tour with Talanoa Treks. If you just want a quick trip, you can meet a guide at the Forestry Office in Colo-i-Suva Forest Reserve and meander through the forest (past the plaque Prince Harry dedicated to the Queen’s Commonwealth Canopy), and jump in the lower pools (there’s even a rope swing). It’s slick, so definitely wear good shoes. The Nabalasere Waterfall Tour is longer; you’ll visit the local Nabalasere village, where all the homes are painted mint green. The thundering waterfall pours into a pool, prime for swimming, and you can meander through the Wailotua caves. Bring a change of clothes and a sulu (a sarong you’ll wrap around your waist) to wear in the village. In the afternoon, head to Novotel Suva for the Drua Experience—a one-of-a-kind traditional canoe tour that takes off from the Bay of Islands in Lami. You’ll set sail aboard Fiji’s only traditional drua, opting to just circle Suva harbor or dive amongst the reefs, then enjoy a bagged lunch. 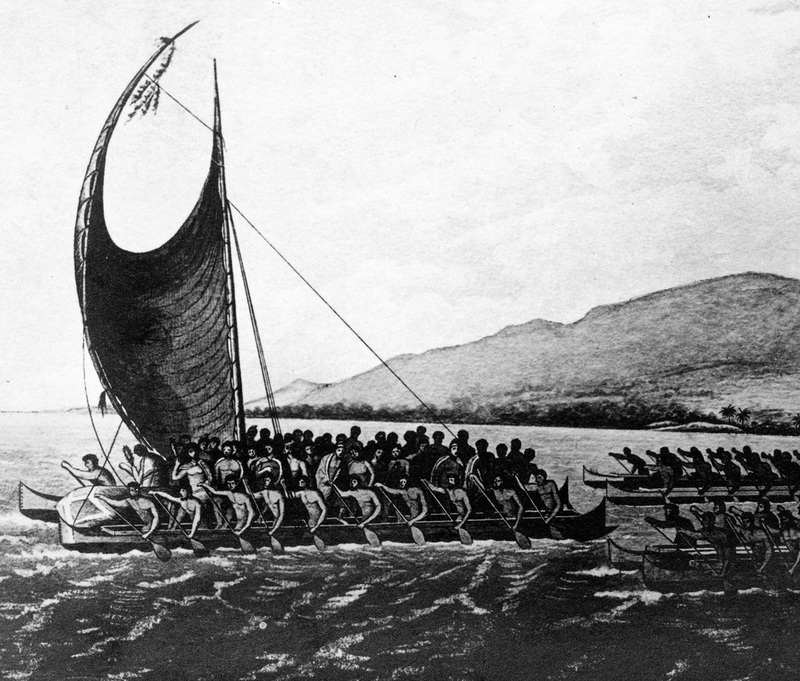 Its massive masted sail, powered by wind, is modeled off a traditional sailing drua Fijians used to journey across the sea. The young staff is incredibly knowledgeable (some have even sailed from Fiji to San Francisco on one) and happy to recount the islands’ rich nautical history. Next, take a road transfer to Nanuku Auberge Resort Fiji. 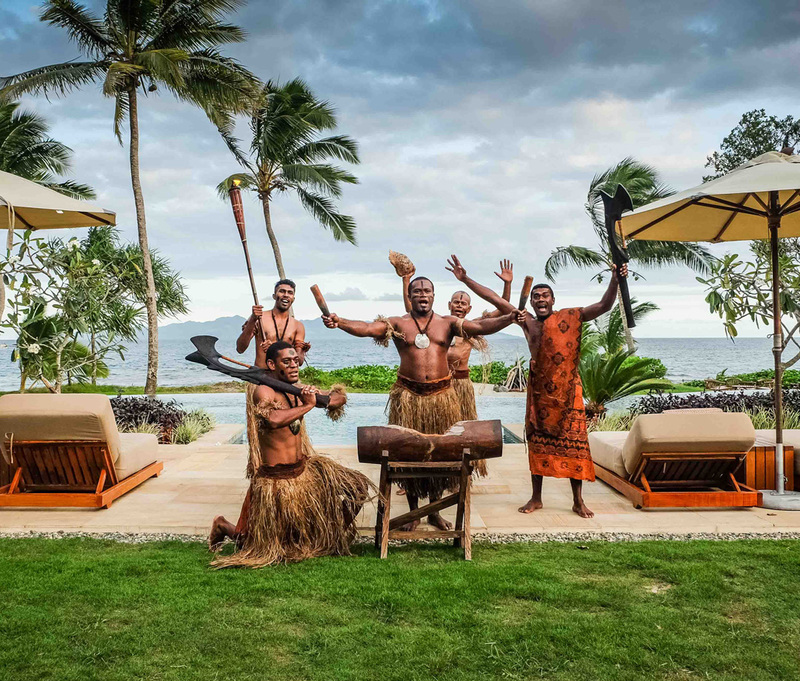 You’ll receive a warm customary welcome from the staff—everyone sings “Bula Maleya” upon arrival and “Isa Lei” at departure—that, honestly, never loses its charm. Get settled in your suite, villa, or residence. If you’re traveling with a group, opt for the 4 Bedroom Beachfront Pool Residence, a sprawling two-bedroom Beachfront Grand Pool Residence with an Oceanview Suite just a stone’s throw away from a private pool (one of the largest at the resort), hot tub, and thatched-roof bure with double daybeds. If you’re honeymooning, consider the 2 Bedroom Beachfront Duplex Villa. Truthfully, you can’t go wrong with any accommodation. They’re all a short walk to the heart of the resort, but you can also call for a golf cart to pick you up, or use the complimentary bikes out front of your lodging. Spend some time soaking in the Jacuzzi, sipping a coconut, and relaxing before dinner. Head over to Kanavata Restaurant and Lounge.The three-course dinner menu changes daily, but showcases the freshest local fare. Though you can also opt to dine al fresco on a cliffside perch with the waves right below, on the beach, or on a treetop platform. Unwind at the outdoor movie theater, then call it a night. You have an exhaustive list of activities to choose from, but there are some notable excursions you can’t miss. 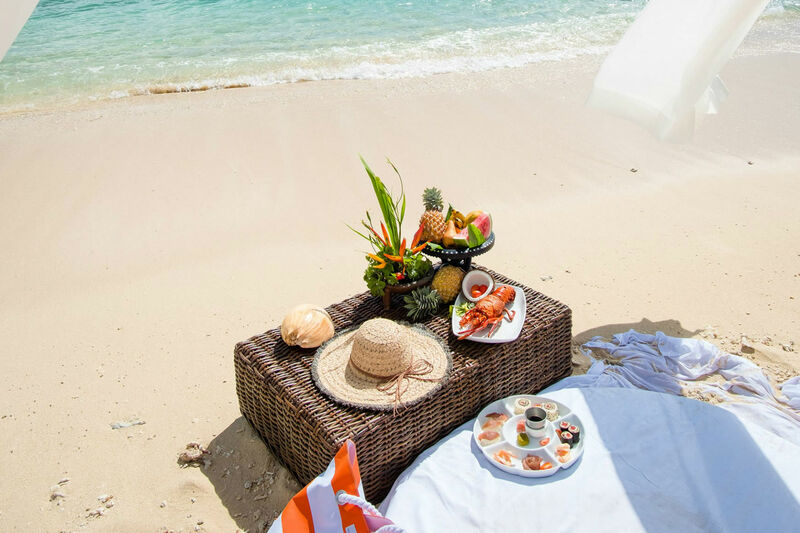 If the tide and weather are permitting, have a picnic on Bird Island, a private, uninhabited island smack-dab in the middle of Beqa Lagoon. You can snorkle, then nosh on a gourmet lunch with champagne. Adventure buffs can surf the legendary Frigates Pass, a world-class reef break 12 miles out to sea. Peak wind and swell conditions render 500-foot-long wave breaks. Or, venture into the depths of Beqa Lagoon and dive with tank-like bull sharks. Under the guidance of dive masters, you’ll descend down to 100 feet (plan on getting your PADI Open Water Certification prior to the trip), and swim with anywhere from tens to hundreds of sharks, up to eight species in all. If you want a more mellow underwater experience, explore the more than 50 different dive sites, rife with soft coral forests billowing below, shipwrecks, and tropical fish flitting about. Deep-sea fishing, jet-ski safaris, and spearfishing are also readily available. On land, you can roll through Pacific Harbour via off-road buggy, or take a chopper to Natadola Bay Golf Course, an elite-level course designed, in part, by former World No. 1 Vijay Singh. Whether or not the weather’s acting up, invest some time over these couple days for activities that immerse you Fiji’s culture. Learn how to forage for coconuts (including how to spot ones embedded in the sand)—to determine if they’re loaded with coconut water, or dried up and past their prime, as well as how to husk, puncture, and scrape the meat out. Take a traditional cooking class, where you’ll make your own kokoda and prepare prawns in bamboo shoots to cook over a blazing open fire. Or, plant mangroves and coral with the onsite marine scientist. 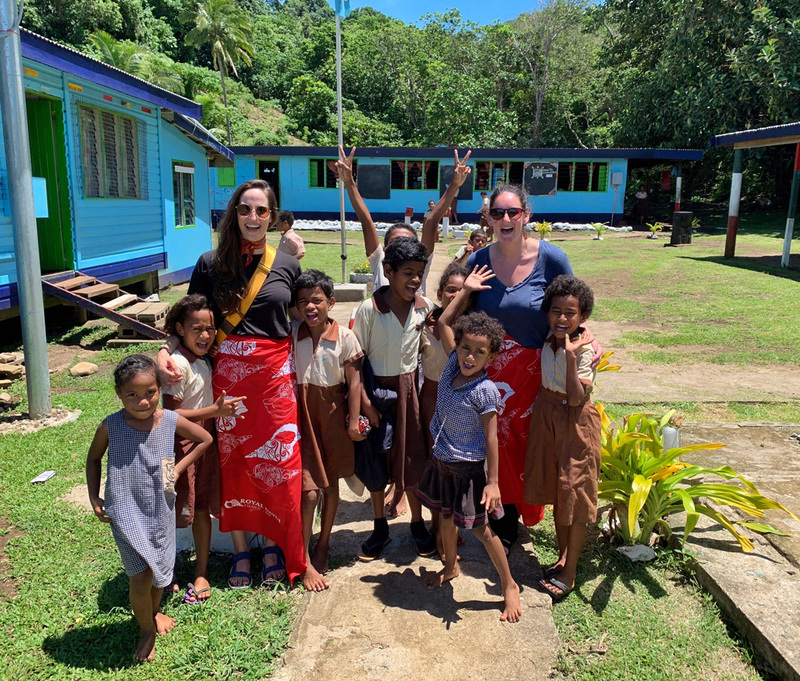 The beautiful thing about these cultural activities is you get a lot of personal time with the Fijian staff—truly some of the warmest, happiest people—and begin to understand their beliefs, spirituality, and unique connection to the planet. For instance, Fijians believe in mana, a supernatural quality or spiritual force that guides every man to their destined path, be it a hunter, healer, or sailor. A sailor can slip their hand in water, feel the current, and know which direction to follow to avoid getting lost at sea. Make sure you participate in a traditional kava ceremony. If you’re visiting a village, you must gain permission from the chief; but at Nanuku, a village priest will come and lead the ceremony. You’ll sit, cross-legged as the chief/priest/host prepares the kava—a mildly sedative drink made from the crushed root of the yaqona plant. The root is pulverized into a powder, placed in a cloth bag, dunked in water, then wrung out repeatedly in a tanoa, a special bowl made of hardwood. The end product resembles muddy water. Because the plant is a member of the pepper family, it does have a bit of spice, but overall kava has a bitter, earthy taste that temporarily numbs your lips and has a calming effect. You won’t be able to follow along with the dialogue and that’s OK. All you need to know is when it’s your turn to drink, they’ll ask if you want a low tide (small cup) or high tide (full cup). Clap once (a strong, cupped-hand clap), then receive the cup with both hands and drink all the kava at once, clapping three more times when you’re done. Kava is the Fijian equivalent of drinking beer with friends; it can settle disputes, serve as a rite of passage, and serve as a social drink. Also be sure to pencil in some time at the spa. If you’re traveling with your partner or honeymooning, the couple’s spa package includes an orange blossom milk bath (don’t pass on the opportunity to sip a cocktail while you soak), a body exfoliation, body wrap, and scalp massage. Of course, hot stone therapy, a deep-tissue massage, and the men’s package—Fijian Bobo massage (“thumbing, kneading, and knuckling”), hydrating facial, and mini pedicure—are also ideal. It’s a quick 45-minute trip from Nanuku to Royal Davui (road transfer, then boat), an adults-only resort perched on its very own island. Get settled in your villa or suite, all of which have plunge pools, lounge rooms, and sun decks overlooking the water. The accommodations mirror the rest of the resort—everything airy and open, reflecting traditional Fijian architecture: thatched roofs and plenty of wood (in an effort to protect the environment, no old-growth trees were cut down). 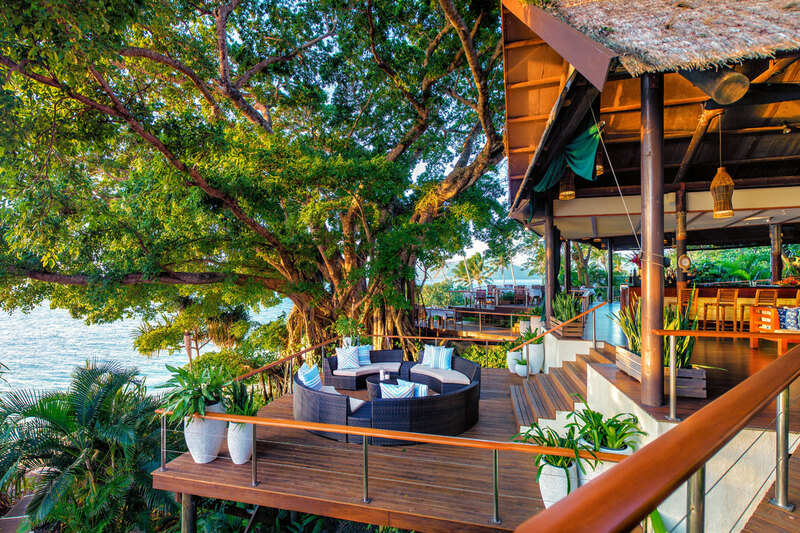 Have a tropical juice (or cocktail) and relish the magnificent banyan tree at the heart of the aptly named Banyan Bar & Restaurant, then explore the resort. There are catamarans, paddle boards, and sea kayaks at your disposal, as well as opportunities for deep-sea fishing to occupy your time until dinner. 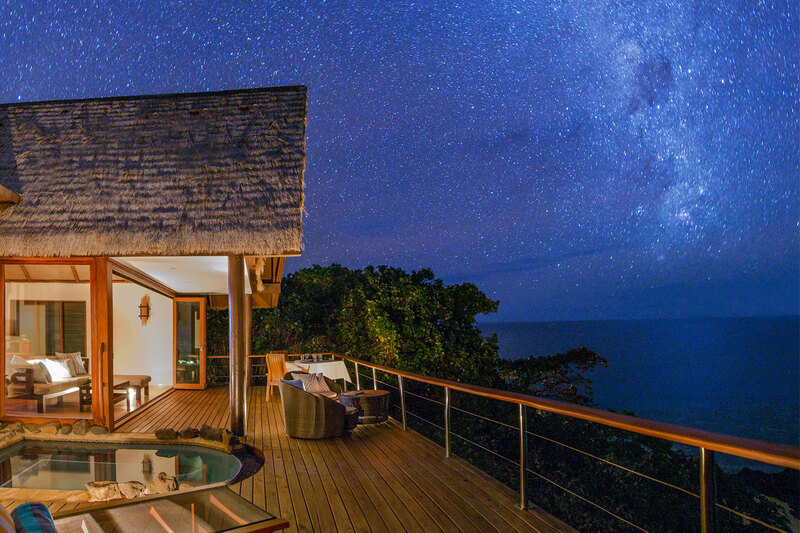 Gorge on coconut-crusted tiger prawns, grilled mahi-mahi over roasted coconut risotto, and banana soufflé with a peanut butter ice cream before stargazing and tucking into bed. In the morning, you can feast on ricotta hotcakes for breakfast, then set out on an island-hopping safari. Snorkel the outer reef; plunge into hidden swimming holes; or head to the mainland for some whitewater rafting, zip-lining, or ATV tours. Enjoy sundowners or a spa treatment back at Royal Davui. On your last day, visit Naceva Village—just a quick boat ride away—to meet school children and observe a way of life that’s been preserved for decades. Note: Any time you enter a traditional village, women should avoid baring their shoulders, and both men and women should wear a sulu (sarong); also remember to take off your hat. It’s a beautiful send-off that reinforces Fiji’s biggest draw: Its charming, affable people. Their homes are simple, stripped-down to the bare necessities, but they live with a richness and brimming sense of fulfillment that’s hard to match anywhere else in the world.